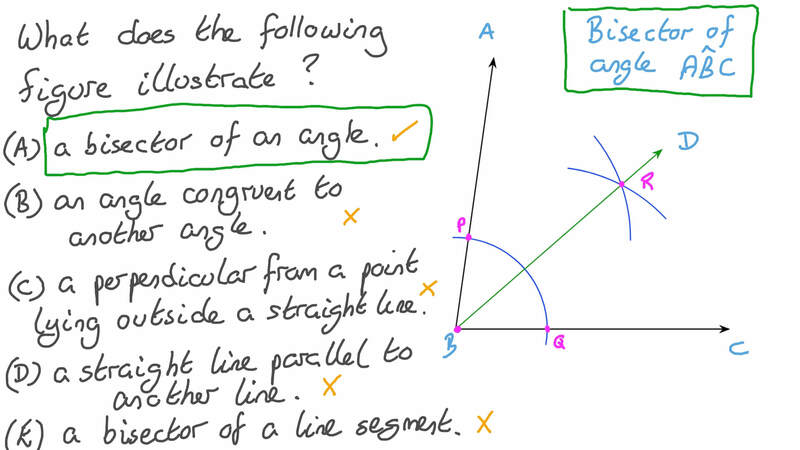 In this lesson, we will learn how to construct angle bisectors and perpendiculars from points outside straight lines. What does the following figure illustrate? Draw any line segment from a point 𝐵 to a point 𝐶 and bisect it at the point 𝐷 . From 𝐷 , draw a line perpendicular to 𝐵 𝐶 to a point 𝐴 . What can you say about the lengths of 𝐴 𝐵 and 𝐴 𝐶 ? What construction is illustrated below? Draw a triangle 𝐴 𝐵 𝐶 in which 𝐴 𝐵 = 3 c m , 𝐵 𝐶 = 4 c m , and 𝐴 𝐶 = 5 c m . Bisect ∠ 𝐵 with a line that intersects 𝐴 𝐶 at the point 𝐷 . Measure the length of 𝐵 𝐷 . Draw the triangle 𝐴 𝐵 𝐶 , where 𝐴 𝐵 = 6 . 2 c m , 𝐵 𝐶 = 1 2 c m , and 𝐴 𝐶 = 1 3 c m . Then draw a perpendicular line from 𝐴 to 𝐵 𝐶 intersecting it at 𝑋 , and a perpendicular line from 𝐵 to 𝐴 𝐶 intersecting it at 𝑌 . Use the ruler to find the lengths of 𝐴 𝑋 and 𝐵 𝑌 . Draw a triangle 𝐴 𝐵 𝐶 , in which 𝐴 𝐵 = 8 c m , 𝐵 𝐶 = 6 c m , and 𝑚 ∠ 𝐵 = 1 2 0 ∘ . Then draw a perpendicular line from 𝐴 to ⃖     ⃗ 𝐵 𝐶 that intersects it at 𝑋 , draw another perpendicular line from 𝐵 to ⃖     ⃗ 𝐴 𝐶 that intersects it at 𝑌 , and finally draw a perpendicular line from 𝐶 to ⃖     ⃗ 𝐴 𝐵 that intersects it at 𝑍 . Use the ruler to find the lengths of 𝐴 𝑋 , 𝐵 𝑌 , and 𝐶 𝑍 . Draw the triangle 𝐴 𝐵 𝐶 , where 𝐴 𝐵 = 5 . 8 c m , 𝐵 𝐶 = 1 5 c m , and 𝐴 𝐶 = 1 6 c m . Then draw a perpendicular line from 𝐴 to 𝐵 𝐶 intersecting it at 𝑋 , and a perpendicular line from 𝐵 to 𝐴 𝐶 intersecting it at 𝑌 . Use the ruler to find the lengths of 𝐴 𝑋 and 𝐵 𝑌 . Draw a triangle 𝐴 𝐵 𝐶 , in which 𝐴 𝐵 = 5 c m , 𝐵 𝐶 = 7 c m , and 𝑚 ∠ 𝐵 = 1 2 0 ∘ . Then draw a perpendicular line from 𝐴 to ⃖     ⃗ 𝐵 𝐶 that intersects it at 𝑋 , draw another perpendicular line from 𝐵 to ⃖     ⃗ 𝐴 𝐶 that intersects it at 𝑌 , and finally draw a perpendicular line from 𝐶 to ⃖     ⃗ 𝐴 𝐵 that intersects it at 𝑍 . Use the ruler to find the lengths of 𝐴 𝑋 , 𝐵 𝑌 , and 𝐶 𝑍 .